You've had a rough few days, weeks, even months, and it feels as though it's never going to let up. It feels like it's been far too long since your last good day, and it looks like it'll be even longer before your next. Nothing feels right, and your full, happy life feels like an all to distant memory. But remember the nights, days, weeks, months, or even just the hours when it did all feel right? Remember the days you laughed so hard you really did think your sides would split, with tears streaming down your cheeks and that wonderful smile-induced ache building in your cheeks? Remember the nights you went to bed feeling content and happy with everything in your life? When you felt like you really were lucky, that you had everything you needed? Remember running and laughing through the rain? Remember feeling the sun's warmth on your skin? Remember the afternoons you spent in good company, talking for hours, planning and reminiscing and dreaming? Remember the mornings you woke up feeling motivated and ready to take on the day, to make it great? Those days aren't gone forever. They're coming again, and probably much sooner than you think. Never forget those days and nights - when you forget them, it can be hard to see a way out of harder times, your vision becomes narrowed and all you see is anguish and hardship, but when you hold onto them, and my god, hold onto them tightly, they remind you of how things can be, and that it won't always be this difficult. 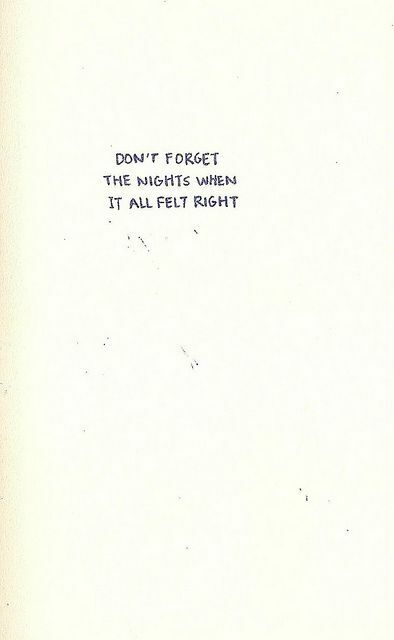 Just remember the nights when it all felt right, and soon enough things will feel that way again.